With a shape inspired by nature but carefully crafted to the smallest detail, the Biophillia sofas from Vondom is the perfect standout piece to anchor your outdoor living space. No curve or angle is left to chance thanks to designer Ross Lovegrove’s precise lines, but the Biophillia looks nearly as if it was formed from wind and water alone. The sleek white sofa and chair feature a high tuxedo-style back and bench seat. A single, unbroken line outlines the entire sofa from the base, up through the high sides, across the back, and back down in a convex arc. 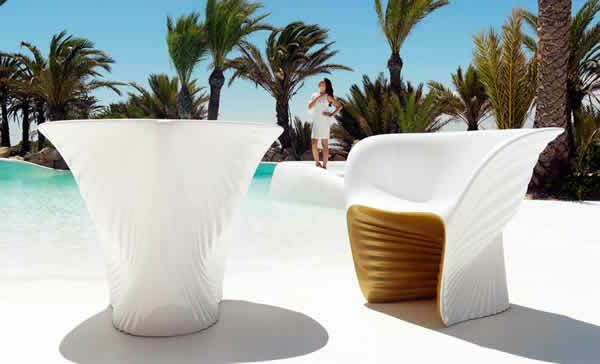 From the side and front, the Biophillia sofas by Vondom seems to open like a clamshell around the seat. From the back view, carved ripples fan outward from the center like the ridges across the outside of a seashell. The result of the careful design is actually an effortless, lightweight feel that brings to mind the bright summer sun reflecting off sparkling water: whether the entire ocean or a small pool. The Biophillia has the inspiration of an organic environment and the feeling of a happy daydream, ready to transport you to a vacation destination without leaving your place on the wide bench seat. Its crisp, white color is refreshing and contemporary, a striking contrast against the surrounding natural landscapes. The harmony of the engineered and the organic is what makes the Biophillia truly stand out on your patio or terrace. How will you group the Biophillia sofas and chairs together for a dramatic arrangement this summer?